Jane-Anne says: “An easy, sea-breezy salad that takes just minutes to put together, and you cannot go wrong if you use the very best ingredients in this simple dish. I’ve specified cooked, peeled prawns from Woolies here, which I admit are expensive, but they are very good, fresh and springy, and a fine ingredient to splash out on when the festive season comes rolling in. If you’re on a low-carb or diabetic diet, omit the Verjuice (which is a little sugary) and use more lemon juice or white-wine vinegar. This is another in a series of new recipes I’ve developed using Verjuice, which is wonderful for making salad dressings with a slightly sweet, subtle zing. Its gentle acidity makes it the perfect companion for ingredients with a delicate taste, such as prawns. To make the mayo, put the egg yolks, salt and mustard into a bowl. Tuck a damp cloth under one side of the bowl to tilt it. Using an electric beater, whisk the yolks until creamy. Stir in the Verjuice, lemon juice and Tabasco and season with salt and pepper. Place in the fridge to chill for a few hours. To make the dressing, combine the Verjuice and olive oil in a small jar or jug. Blanch the asparagus tips in boiling salted water for 1-2 minutes, or until just tender-crisp. Drain then plunge into a bowl of iced water to set the colour. Leave for 3 minutes, then pat dry on a clean towel. 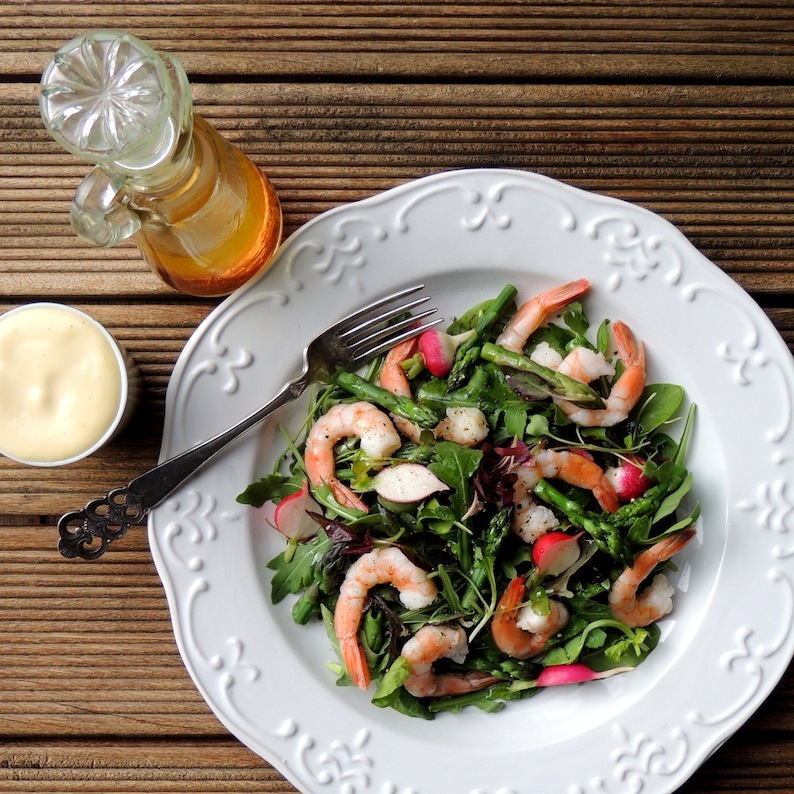 Put the salad leaves on four plates and arrange the prawns, asparagus and radishes on top. Drizzle with the dressing (give it a good shake first) and serve with the mayo and plenty of warm crusty bread. If your mayo ‘splits’, or does not thicken, start again with a clean bowl. Place a whole egg yolk in the bowl, whisk till creamy, and very gradually dribble on the split mayo mixture, whisking all the time, as above. In most cases the mayo will re-emulsify.